Being a mother to a 7-year-old is a wonderful thing. My 7-year-old is smart, sweet, funny and thoughtful. She'll sit and have long chats on all sorts of topics. She loves to make announcements. She'll sing and dance and draw until she falls into bed. The journey I embarked on 7 years ago as her mother has been harder, more exhausting and far more complicated than I ever imagined. It's also been so much more wonderful too. I feel so blessed to have this little girl in my life, all arms and legs and heart. My life is so rich because of her. 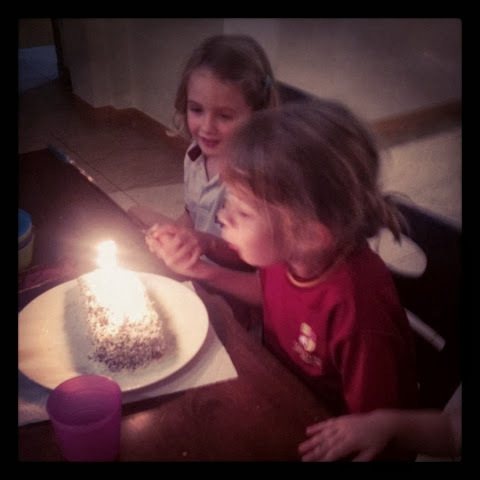 All she wanted for her birthday was dinner with her family (spaghetti bolognese and lamingtons) - oh and maybe a camera. Happy birthday, my sweet girl. And thank you for seven wonderful years.